The Magic Trimmer Bud Trimmer - ON SALE! - FREE Shipping! One of the best things you can do to make your harvest successful is invest in The Magic™ Trimmer. You will want to ask yourself how you ever did your harvesting without one. The detailed patent pending design safely removes the trimmings from your plants in a fast and effective way. The Magic™ Trimmer stands out against other trimming machines because its affordable, handy, cuts all kinds of plants safely, and gets the job done fast and right. 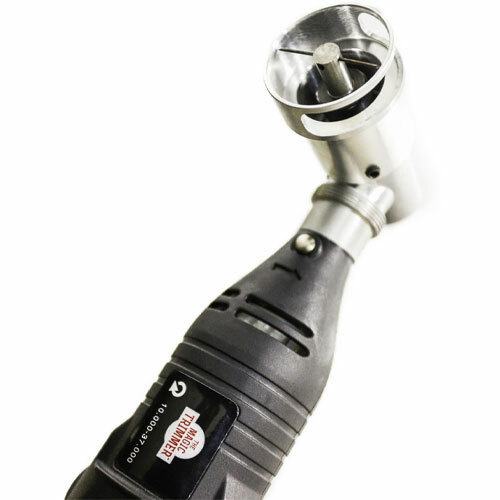 You don't have to spend thousands of dollars on a over sized trimming machines, you control The Magic™ Trimmer and know exactly what your cutting, its hand held power trimming is precise to your movement. Includes a 1 Year Warranty. Specs: 110 V 50/60 Hz 115 W No-Load Speed: 33000 r/min. US Patent Pending. U.S. Patent Application Serial No. 14/287,309. The Magic™ Trimmer stands out against other trimming machines because its affordable, handy, cuts all kinds of plants safely, and gets the job done fast and right. You dont have to spend thousands of dollars on a over sized trimming machines, you control The Magic™ Trimmer and know exactly what your cutting, its hand held power trimming is precise to your movment.